With more and more city dwellers and suburbanites embracing the notion of getting back to basics and living simpler, more rustic lives, it's no surprise that the popularity of backyard chicken keeping has skyrocketed in recent years. Whether for enjoyment as pets or for the convenience of farm-fresh eggs right outside your door, chicken keeping can be an easy and fun step on the road to more sustainable, ecologically friendly living. 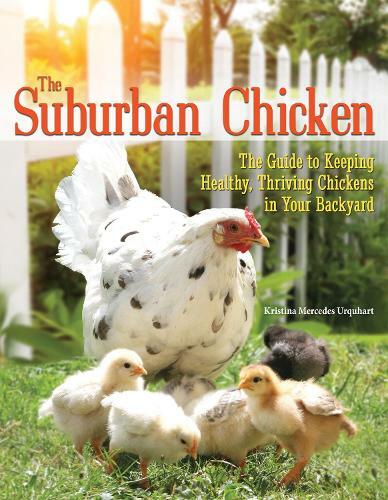 Written by Kristina Mercedes Urquhart, The Suburban Chicken shares the author's knowledge on general chicken husbandry, profiles of 20 suitable breeds for suburban living, how to provide your birds with optimal accommodations, and the healthcare needs of chickens, among other important topics about which prospective chicken owners should be familiar. INSIDE SUBURBAN CHICKEN: *The benefits and enjoyment of keeping chickens as pets. *Considerations for would-be chicken keepers, including local ordinances, space requirements, initial and ongoing expenses, and preparing the home and family. *Favorite standard-size, bantam, and egg-laying breeds for metropolitan and family living. *Hatching eggs and raising chicks. *Coop styles and descriptions of all equipment that a budding chicken keeper needs, as well as a chapter dedicated to keeping chickens safe from predators. *Preventive care and optimal diets for healthy, hardy birds. *Raising chickens for eggs: the science behind egg production, how to properly handle and store fresh eggs, and the differences between store-bought and homegrown eggs, as well as some exciting recipes for your bounty.